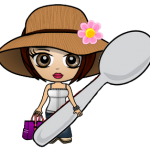 Thanks for sharing your Spoon Theory. I will never look at a spoon the same way again! My favorite line is “I don’t have room for wasted time, or wasted “spoons” and I chose to spend this time with you.” Lovely.